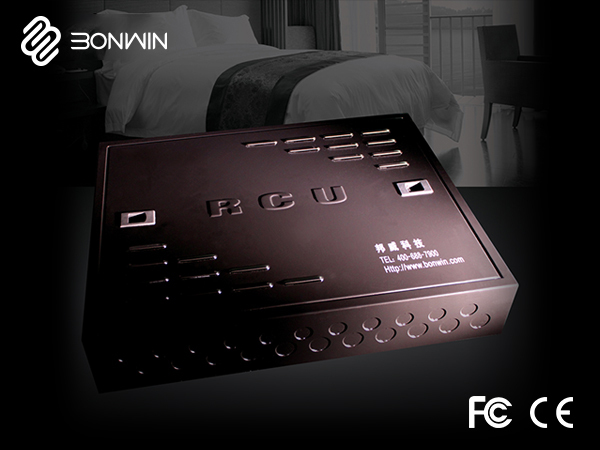 Bonwin RCU is a unique generation of hotel Guest Room Control Unit which uses the international most advanced microcomputer control chip. Through the TCP/IP communication protocol, it can control and monitor different target and equipment, such as panel, curtain, doorbell, lamp, fan and air conditioner and so on. 2. Through the RS485 communication protocol, the real-time temperature and temperature parameters set by user could upload to the "iPad"-control system. Room control unit uses the most advanced and international microcomputer control chip. Room control unit uses NTC high precision sensor to detect indoor temperature. Through the RS485 communication protocol, the real-time temperature and temperature parameters set by users could upload to the "iPad"-control system. Hotel room control system with science management can save energy and has the ability of remotely controlling BWRCU388 RCU host. Using manual and automatic dual control modes and the priority is given to the manual control. Choice of heating, cooling and ventilation modes. Users can set the temperature, adjustable speed and switch time. Thermostat does not directly control the air blower. The weak current controls the strong power in order to completely eliminate the risk of the users' security. BWRC388 RCU including the main control, power, light, transformation and other modules. It is made by Metal Baseboard, Orbit and Shell etc. You can adjust the strong current module according to your request. Material: 1 MM Painted Baosteel plate. “Super Brain” - Use the 32-bit ARM processor. It has a strong ability to fastly run multi-tasking operating system;Adopt advanced and stable TCP/IP communication protocol; It has AI-BUS anti-collision patented technology, and the automatic bus arbitration; It runs fast but cost little implementation; The original terminal board design made it easy to install. Fuse protection is provided for the input and output terminals. Output current: <5A It has over-current and short-circuit protection automatically reply. It can flexibly arrange for electrical appliances as the output capacity ratio differences; Use Hongfa Relay 10 A output ; Output configuration is protected for short circuit or over-current.